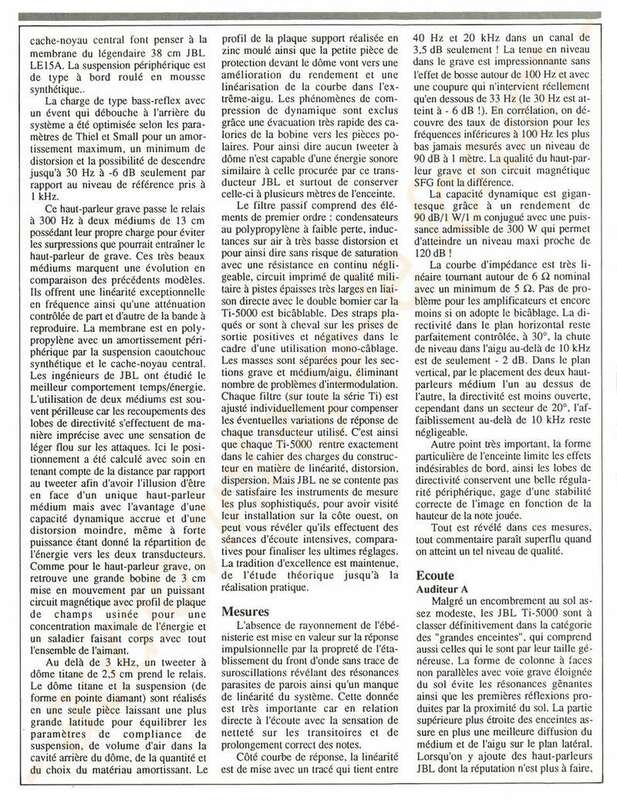 Là j'attends de voir si le vendeur va les lacher et à combien avec les blocs Altec. Love this speaker!!! If you like bass, this is a killer... Bought them after listening to the Ti250 Jubilees (model 2000). Very warm sound, unbreakable. Use them with 2 DENON POA6600a monoamps, DENON CD 3500, Audioquest MidnightII speakercable, Audioquest XLR Balanced cable. These speakers need A LOT OF POWER!!! The more, the better they sound. Big boy toy...have fun! 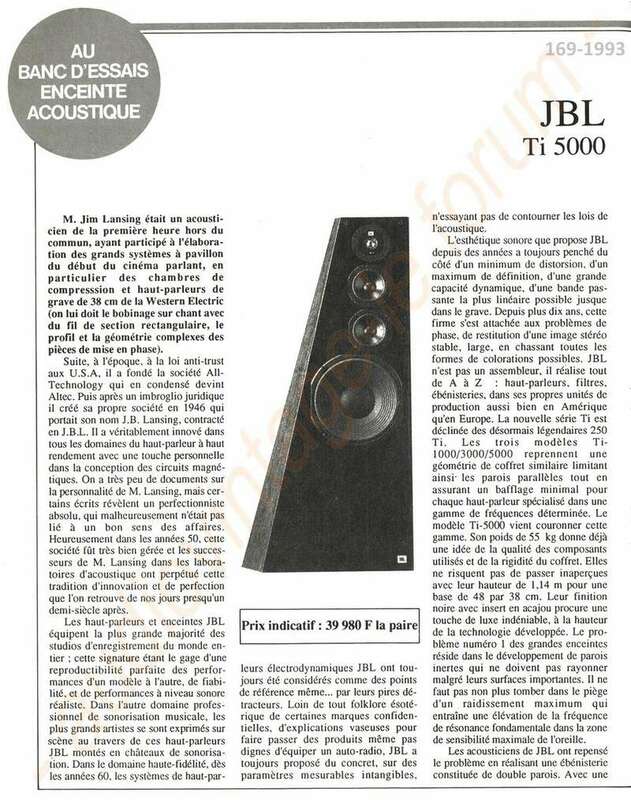 In the year 1996, I heard the JBL ti5000 for the first time in a demo room. At this moment I was thinking for buying a B&W matrix 801 mkIII, the reference speaker of B&W. After the listening session and comparing both speakers, I changed totally my opinion. The JBL had a much tighter an more natural bass sound. The tonal balance (high, mid and bass ratio)is one of the best I ever heard. The ti5000 brings every musicstyle (pop, jazz, rock, classical music, etc. )in an excellent way ! 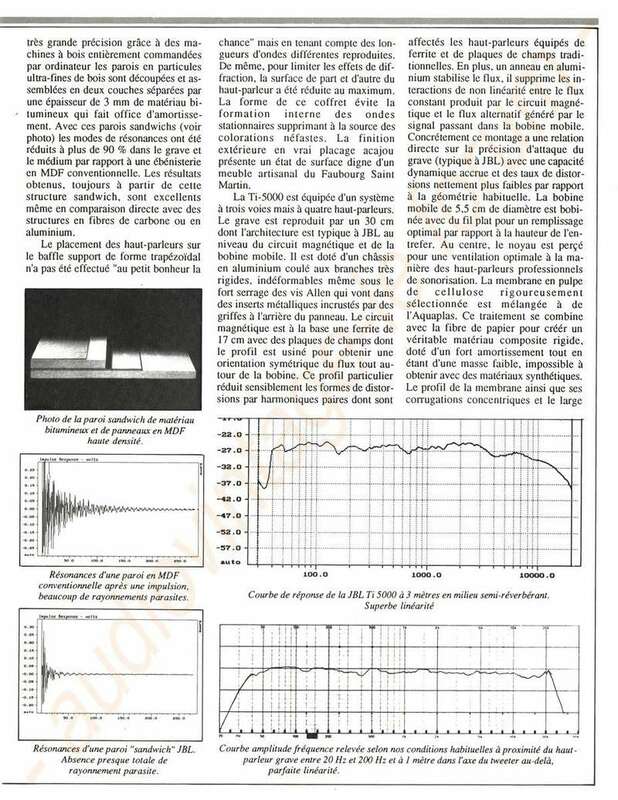 A Mc.Intosh MA6400 integated amplifier was the first amp. that I used. A Mc.Intosh C38 + MC150 combination resulted in tighter, more powerfull and a better controlled sound over all. Now I've replaced the MC150 by a MC500 power amp. 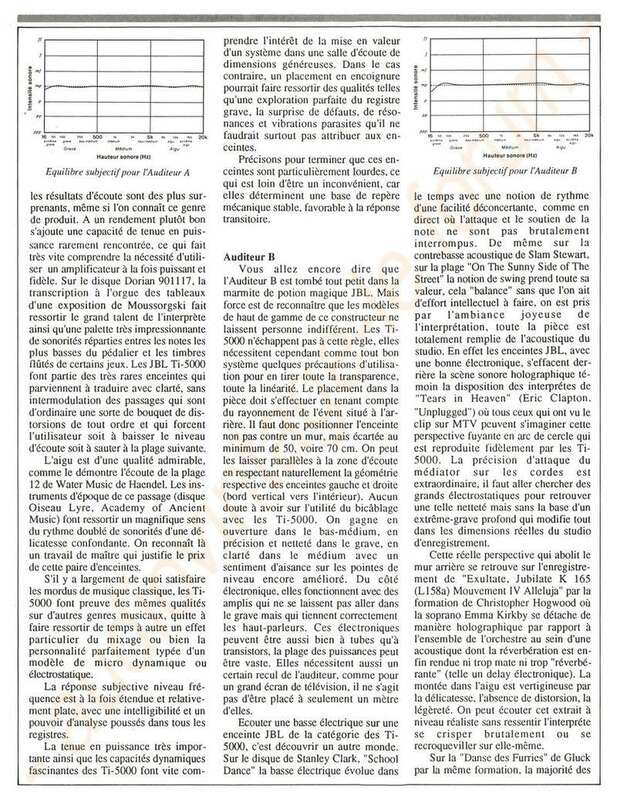 On this amp, they have an impressive dynamic range, much more detail and an openess, transparance, what let me believe that the music is "real" now!! This speaker let me enjoy the musicality of my Mc.Intosh combination, and has realy no weaknesses. A very resonance-free titanium tweeter. Two high quality drivers in a speaker configuration, for excellent medium range. A 12" tight woofer for natural bass sound. No distortion or stress at any dynamic levels. 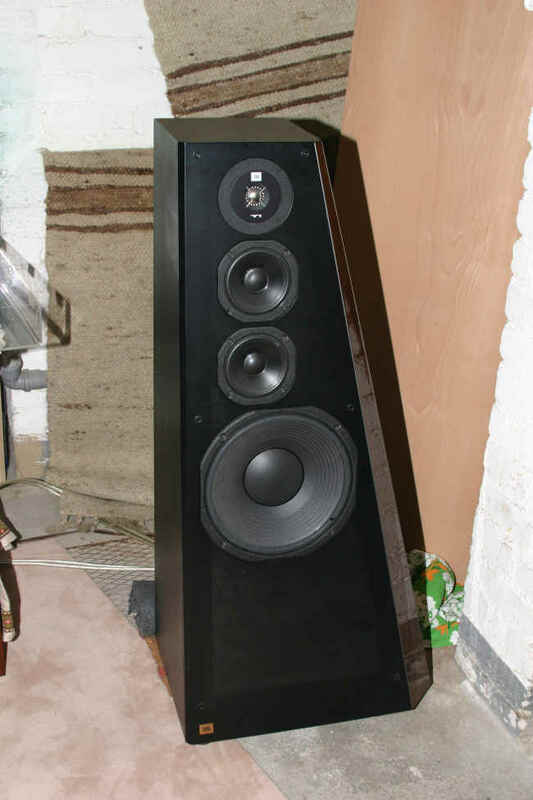 Size of the speaker in a living room. Rubber foot must be replaced by spikes, while using a tight and quick 500 watt power amp. I compared the ti5000 to a B&W matrix 801 mkIII, Dynaudio contour 1.8mkII. I bought a pair of these spaekers second hand. I got them really cheap, I think. The speakers are just so loveble, just great. I just a rega planet cd player and a Denson Beat 100 as Amp. This is a great combination with the Denon AVR-1800 which I use as for Home-cinema. This is really all any Home-cinema/music lover will ever need. This speaker goes really LOW and always in control. Unless you turn the knob to unreasable level, music stays clear and crips. But this due to my amp and not the speaker. At the audio shop I''ve also tested it with a 400W amp. It almost blew my eardrums, you''ve gotta hear it to believe it! well i think that i said it all in the top tekst.............but one more thing..
if u get the opportunity to hear or even buy a speaker like that, then dont hesitate, go buy it!!!! well the only weakness i´ve come up with, is my living room!! i use the thule ia250b , it has so much control of the speaker, that the speaker, that the accustic of my living room is spoiling the sound, but i´ve heard them in a real cool test room, and they sounde´d like a dream come true!! they weight 58kg eache, piramide model. I used the JBL ti5000 as front, JBL LX7 as surround, B&W center speaker cc6 s2,and a little jbl active sub,but the subwoofer is to weak ,I buy soon a rell stadium 2, or a rell stentor,and than it is compleet for 5.1 Home Cinema. everything, good bass, verry good trebble, good midrange. Denon 3801 reciever, Marantz 63se cd player, BI wiring cabels. 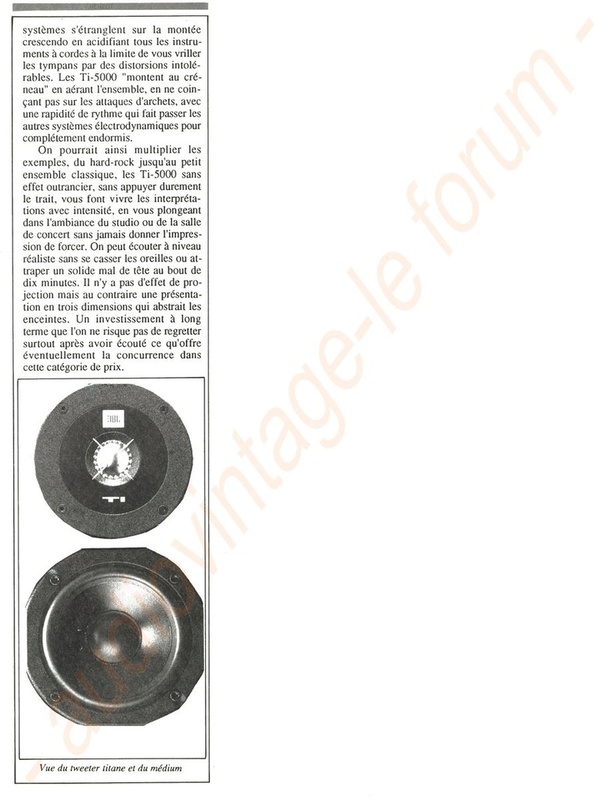 :: LES ENCEINTES JBL :: Dossier sur les modèles JBL.